( First my comment: these Taliban are childish enough to believe they can change our world through “callous and cowardly acts” , but let us not forget: they were brought up by western warlords to combate the Russians in Afghanistan … thus they are also the product of OUR wars). Published on BBC, by news channel, 20 October 2008. Gayle Williams, 34, was a UK and South African national. She was killed by two men on a motorbike, witnesses told the BBC. 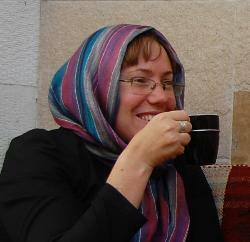 The Taleban are reported to have said they killed her because she was working for a Christian organisation called Serve Afghanistan. Her Kabul-based colleagues also released a joint statement, calling Ms Williams an “inspiring” person who “put others before herself”. The secretary of state for international development, Douglas Alexander, called the killing a “callous and cowardly act”. Ms Williams leaves behind her mother in the UK and a sister in South Africa. This year 29 aid workers have been killed in Afghanistan; five of whom were international staff. In August another aid group, the International Rescue Committee, suspended operations after three of its foreign female staff – a British-Canadian, a Canadian and a Trinidadian-American – were shot with their Afghan driver close to Kabul. The Taleban claimed responsibility for that attack, saying the women were foreign spies. (full text). Read also: … “We must remember that these men have a ruthless plan for the world in the form of a theocratic Islamic caliphate. In Taliban-ruled Afghanistan we saw a glimpse of their utopia: women degraded, freedom denied and followers of other brands of Islam exterminated” … (full text).